As scores are entered in the gradebook, you will want to save grades periodically. Saving grades ensures that your work will not be lost, but it does not allow students and parents to view those grades. 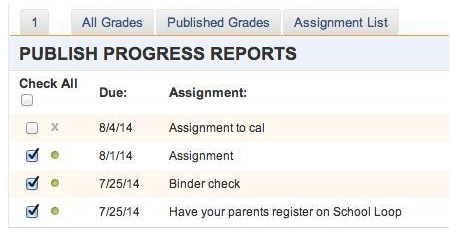 Publishing progress reports is a separate action you must take to share grades with your students and their parents. This two-step process (save and publish) allows you to control which grades students and parents can see and when they may see them. Look for the orange Progress Report Publishing button on the right side of the main Gradebook spreadsheet. Check the box for the assignments you wish to include in the progress report before clicking the Publish button. You get a 'Success' message once the progress report is published successfully.